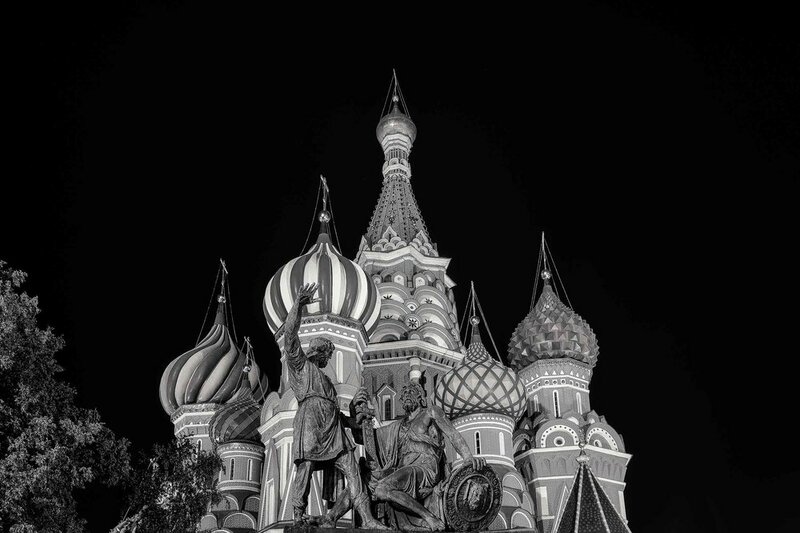 I spent several hours on two lovely, warm summer evenings, photographing in and around Red Square in Moscow. I remember saying out loud "does it get any better than this?" I was just one of thousands of people moving through this very popular tourist precinct and was able to photograph without interference, except for some friendly interaction with local tourists. Some of them wanted to know about my fancy pants camera gear. Others asked me to make a picture of them in front of St. Basil's Cathedral or one of the other iconic structures surrounding Red Square. St. Basil's Cathedral is a major landmark for any visitor to Moscow and one of those places I've long wanted to photograph. Even as a teenager I can remember that news reports dealing with the Kremlin always seemed to feature an image of St. Basil's. As a result I thought it was the Kremlin. Now I know better. It's just such an iconic structure and so unmistakably Russian that St. Basil’s Cathedral makes a perfect backdrop for a foreign correspondent's report. Talk about an exotic location for night photography. While I made lots of images that featured the full length of the cathedral, in the case of the photo at the very top of this post I opted to exclude the foreground to avoid the stream of people moving in front of my lens and through the frame. As a result you wouldn’t know they were there. In fact thousands of people probably moved through this magnificent space while I was making photos. Warm sunset light illuminates the Kremlin and St. Basil's Cathedral in Red Square, Moscow. The Best Time To Make Night Photos? I made the image at the top of this post around twilight when the brightness of the natural daylight was closer in intensity to that of the artificial lights around St. Basil’s. I like the eerie quality of the image which, I believe, is due to the timing of the photo, as day began to transition into night, and the mix of daylight and artificial light sources. It's amazing how the mood of the masses adjusts to the environment. Even the more raucous visitors were somewhat hushed by this most beautiful structure bathed in soft, glowering light at day’s end. For anyone traveling to Russia an evening visit to St. Basil's Cathedral and Red Square is not to be missed. Next time I might try to visit in winter. Now that would be tough fun, wouldn't it?